Riding a new bike does not prepare you for appreciating the quirks and foibles of an old bike. This BMW R800 kept floating in between N and 1st gear, switching between the two as it saw fit, usually on roundabouts or when needing to get out of a situation fast! Other than that, the steering felt loose compared to the F700 GS (Freja) and turning had to be a lot more controlled and thought through. Having to re-learn instinctual behaviour was difficult but the green machine (Esmerelda as she was named eventually) held up fast and didn’t complain too much on the journey. 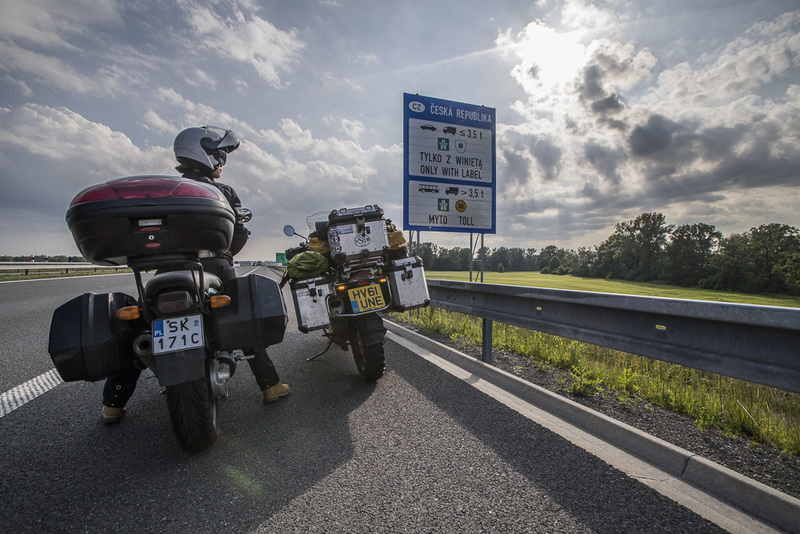 We left Poland and sailed through the Czech Republic, enjoying the greenery and the relaxed, laid back people who were taking long country walks despite it being a Thursday. Camping in a park, having snuck in through the cycle lane, we relaxed in the buzz of early summer, the air heavy with flowery scent. One of the practical downsides of being in the EU is that there are limited public toilets and those which do exist one has to pay two euros to use. Not having any cash in an otherwise card based economy is a bizarre puzzle which will a while to fix. For the meantime, we were happy just cooking a sausage casserole and listening to the parties held elsewhere in the park as the night drew in on days which were accelerating alarmingly, hurtling towards an inevitable end for the journey. 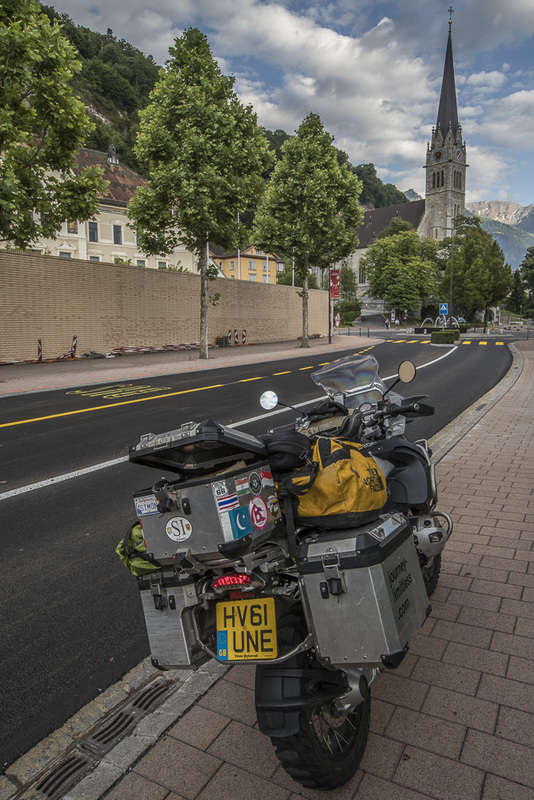 We rode though Austria, marveling at the tall spires of its many pretty churches. Towns nestled in green valleys, telltale pastel colours of homes blinking as we soared past on beautiful roads. Cars filled with road tripping families, roof racks packed with bicycles and trailers filled with bags, the continental europeans common holiday as we waved on our way past. No one was interested in us at all and it was a curious feeling which gave the impression of the journey already being over. Other bikers became a far more common sight and less and less of them waved back as we powered back towards our old lives. Austria become southern Germany, Germany became Austria again and then Liechtenstein and then Switzerland. As the last comfortably plush buildings in the neat and tidy Liechtenstein rolled past (in record breaking speed as the country is so tiny!) we were finally in Switzerland, admiring the jaw dropping beauty of the mountains and neat greenery. We admired the wonderfully constructed roads and tunnels as we bored through mountains and through valleys, winding around crystal clear lakes. It was close to sunset as this was a long ride from our previous, rainy, night in Germany where we’d camped finally in a campsite as wild camping proved impossible on a summer weekend. We’d dined with a German family en route to Croatia by caravan. We bonded over pizza produced in their pizza oven and we wondered, as we munched, where we could fit a pizza oven on our bikes. 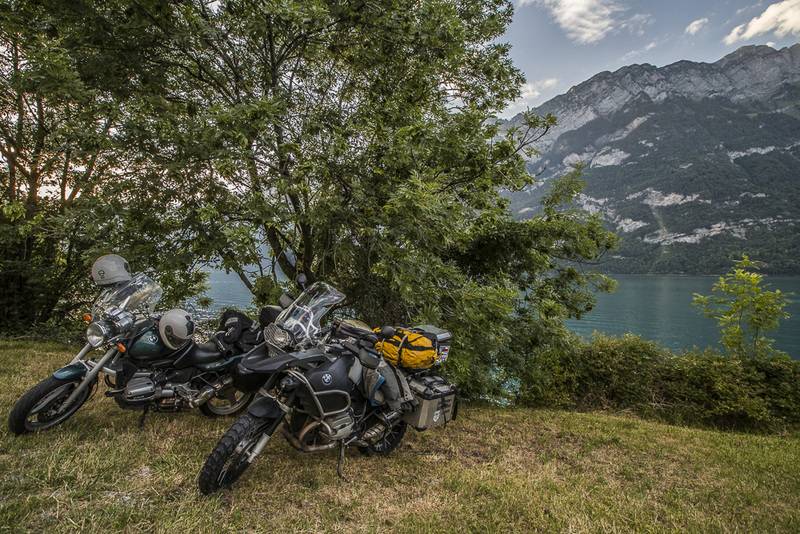 It was in stark contrast to our first night in Switzerland, we found a secluded spot on the banks of a turquoise lake surrounded by mountains. The evening was perfect and warm and deserted of people. Our tent was perched just above the water and we could hear the gentle rush of the occasional car on the highway winding around the lake. The water was so perfect the morning demanded a quick swim, a refreshing start to the day’s ride to France via Geneva. The water was perfect, cool and clear. We were a little sad to leave our safe idyll but we had an appointment in Geneva to pick up our friend from the airport who we’d not seen since departing the UK in July 2016! Eating an expensive croissant and coffee at a petrol station (£12 for a pastry and coffee!!) we eventually reached Geneva airport and were reunited with our friend! 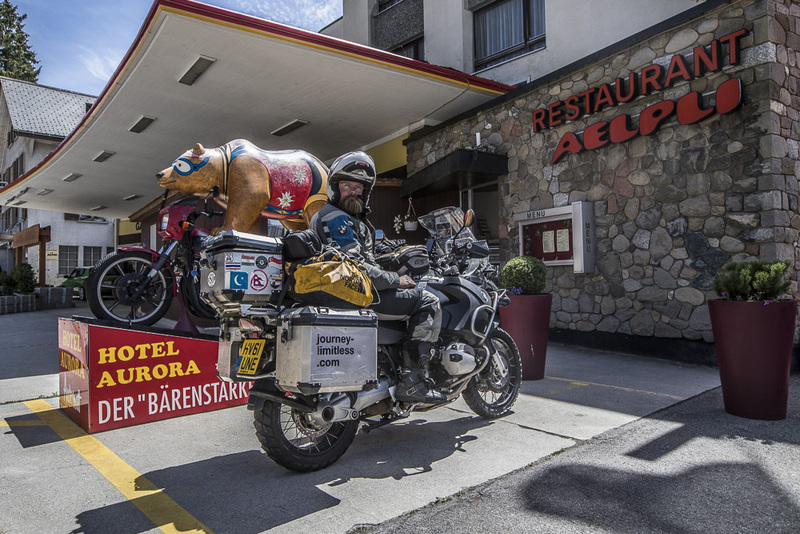 This was not before riding the Furka pass. Unfortunately, the pass was undergoing some maintenance. This meant that there was a single file traffic pass so we had to queue to enter the pass. Queuing along switchbacks definitely negates the point of them! We finally made it through the climb section and then the pass was clear. Winding around the famous pass was quite the experience, it was inundated with other bikers, most who wanted to complete the pass in a world record breaking time as they almost lay flat on the turns, knees brushing tarmac in a race posture. A tiny village nestling in the valley was really sold on the bear theme, bear hotels, bear cafes and tiny cobbled roads made it into a picturesque and pleasant breakstop. 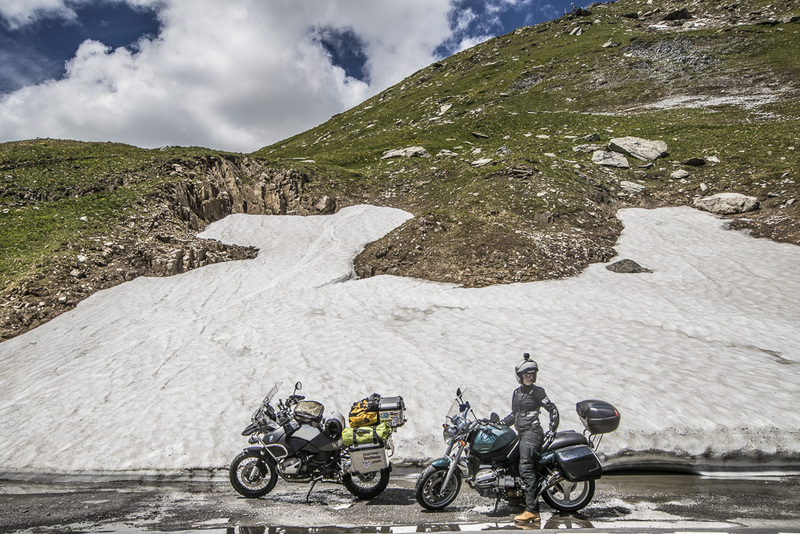 The top of the pass was still covered in snow despite the June sunshine. The breeze would occasionally blow some of the cool air across us as we sailed through, cooling us considerably. The way down the pass was easier, with less obstacles and road works to compete with. Only impatient bikers who were still determined to exceed speed limits by unknown levels. The cool fresh air was welcome but Geneva beckoned so we continued on. after collecting Jarek from the airport, a quick ride to France and Alex saw her cousin who kindly let us stay the night. This would be almost our last day of the journey with only a couple of stops in the Vosges and Paris before catching a ferry to the UK. It felt almost like the last month had been played in fast forward and the beginning of the journey was a distant memory, intangible in its reality, taking on both the sensation of being an eternity and a fleeting moment simultaneously. 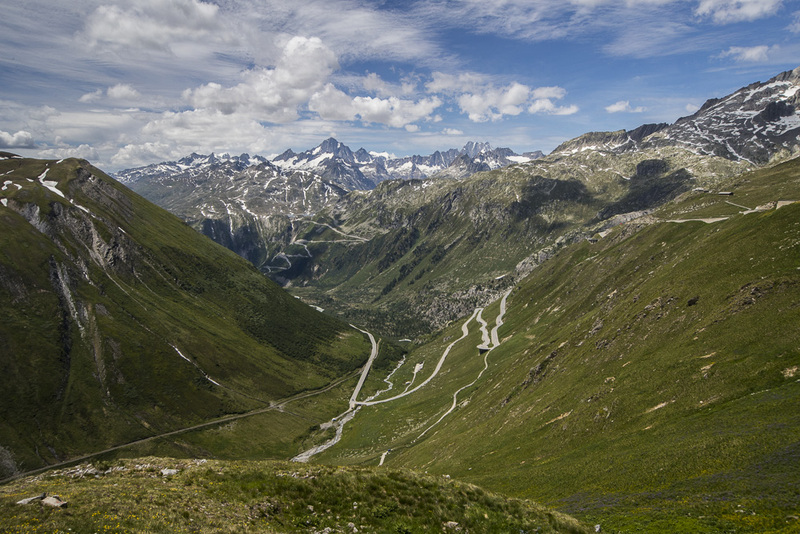 The riders on the Furka pass were mostly unfriendly, focused only on their speed and progress. We stumbled across them coming from the East whereas they generally were local or coming in from neighbouring countries, only one in ten would nod back or hold out their hand. The novelty of bikers had worn off for them and they were there only to fulfil a selfish ride whereas for us we hadn’t seen so many bikers since the sea of mopeds in South America or the unfortunate ride by of the Russian bikers in Ukraine. One major positive from mainland Europe the Brits can learn from is the amount of space left between lanes by motorists when stuck in slow moving traffic on a motorway (I’m looking at you, M25!!). The idea is to create an emergency corridor in case the tail back is created by an accident, it also makes for easy filtering!! This never ever happens in the UK. Instead cars crowd, staggered, trying to see up ahead as if it would make any difference to their position in the traffic. 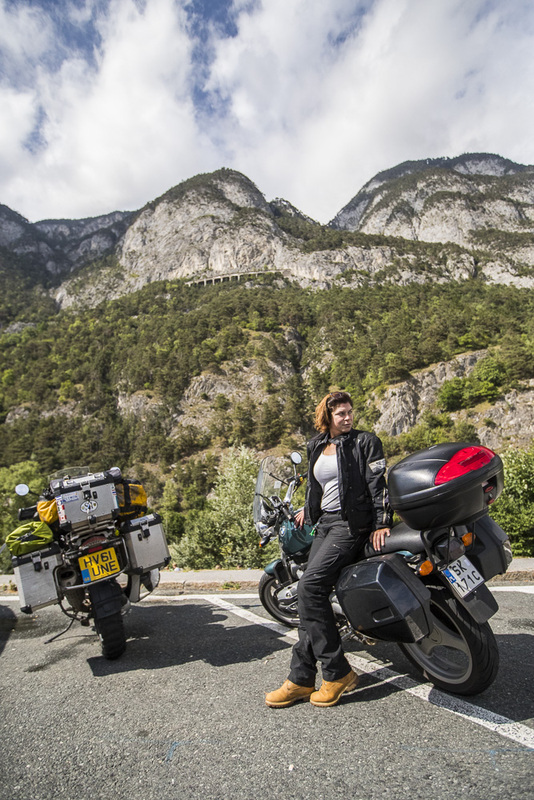 We had all that to look forward to on our return, for the time being, we enjoyed relaxing in France, catching up with family and resting for a ride to the next family stop.